Welcome to the end-of-the-week update from your friendly neighborhood developers at bi-coastal CSE. We’ve been busy this week, continuing to iterate on our first siege scenario as well as planning more siege-related work. Of particular note: We continued adding improvements to building destruction, began concept work on Realm variations of the trebuchet model, and updated the map’s visuals. Backers were able join us in testing these changes and more every day this week! If you missed this week’s livestream update and Q&A with Mark, you can find that HERE. We’ll also be having a castle siege playtest this weekend. We’ll be sending out a separate email with further details. WIP – Updated Ability System and Editor: Even as work continued to progress on the ability system and editor, several of the engineers worked on scoping and planning the remaining work to be done. While this process has taken longer than we’d like, in the end, we will be able to add more functionality to the system and make it much easier and faster to author abilities for the system. Building Destruction: Andrew continued to add improvements to the performance and responsiveness of building damage. WIP – Terrain Position Improvements and Shareable Octree (Movement Bugs): Lee finished part one of terrain offsets, which allows objects to be at the same relative height above the terrain on both server and client. This work continues to reduce issues of getting stuck in terrain or inaccurate building stability. Part two of terrain offsets, which must be completed before implementing the finished part one, will be fast terrain height query. As part of that effort, Lee created ShareableOctree (a way to spatially store objects for fast queries on multiple threads while still allowing updates). This will be used to store terrain pieces, and will allow for much faster terrain height queries, among other things. Tech – Weapon VFX: Wylie added helper positions that attach to models/skeletons, allowing us to support attachment points for particle systems, such as trails. This will greatly reduce the unique number of VFX we need to author. Tech – Building Rubble: This week, Colin made the building server generate rubble faster (by removing some networking steps that were adding latency). This should make building destruction feel more responsive. WIP – Updated Crafting UI: We completed some initial internal useability testing. The issues found have been addressed by AJ. He’s wrapping up that iteration for more testing. WIP – Tech – Animation Pops: No one likes animations popping! Least of all animators! We began to address some of the issues in player movement animations that appear to give the characters a “pop” between movement animations. WIP – Design – Classes: Ben finished up work on the Shapeshifter class design and has begun work on the Scout classes. WIP – Art/Tech – Trebuchets: Dionne updated the trebuchet visuals. This will be followed up with a more robust animation pass, which will also support ammo during the animation, similar to our bow abilities. Mike and dB are making new FX for it, and will eventually add new FX for the Realm variations. Matt is continuing to generalize and stabilize his quick work that got us the trebuchet at the end of last year. WIP – Art – Trebuchet Concept Art: Michelle completed concepts of re-skinned variations of the current trebuchet model. Our goal is to not only spruce up the current version but also make sure players can differentiate their enemies’ siege equipment on the battlefield. Art – Skill Icons: James finished the new ability icons for the Dark Fool and began work on the Skald. Art – Animation 2.0: Updated style and timing support. WIP – Two-Handed Sword: Sandra continued work on the new animations that will allow us to share these amongst all classes, as well as support better visual timing based on the ability system, once that work is added. WIP – Mage Shared Casting: Scott updated all the skirts for the shared casting animations and has blocked out an updated self-cast. Next up…finish capes! 2.0 Animation Testing: Scott set up all of the retargeted animations for the new skeletons on the master sheet for testing. Art – Characters 2.0: Better-looking and more performant characters! Platypus and Testing: We vetted the supporting code for Characters 2.0 this week, working out the bugs and getting this into a local machine for testing. Over the next week, we’ll be vetting all the art assets (including animations), fixing bugs, and then making the switch to the new versions on Master. After that, we’ll begin importing the character LODs to improve the visuals at range as well as performance. Male and Female NPC Generic Clothing and TDD Autumn Armor: Jon completed the 2.0 update to the male NPC clothing as well as the autumn armor. 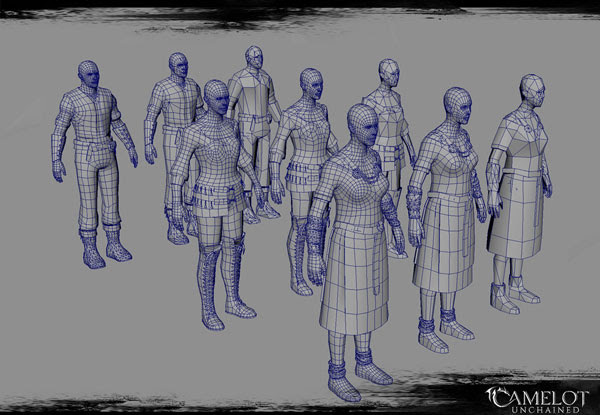 Dionne finished cleanup of all six base NPC meshes, and began work creating the LODs to improve performance. 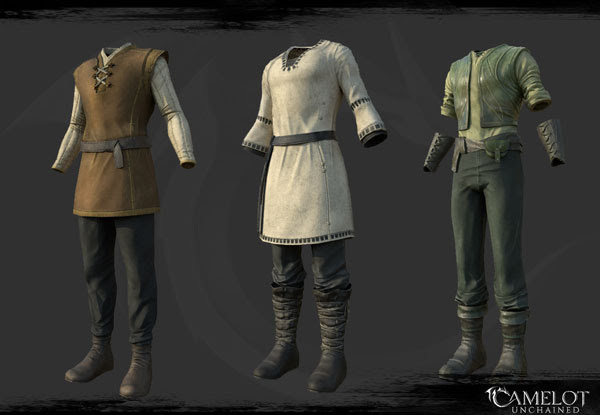 This iteration will set up these outfits for future use by players as non-combat-oriented clothing. Updated Valkyrie: Jon proposed some improvements to the look of our Valkyries. That work began in his free time and has now turned into approved work. We’re also adjusting the characters physique to further differentiate the race from our Humans. Next week, I’m equally excited to go through the audit of the character 2.0 work as I am about working on new trebuchet models! 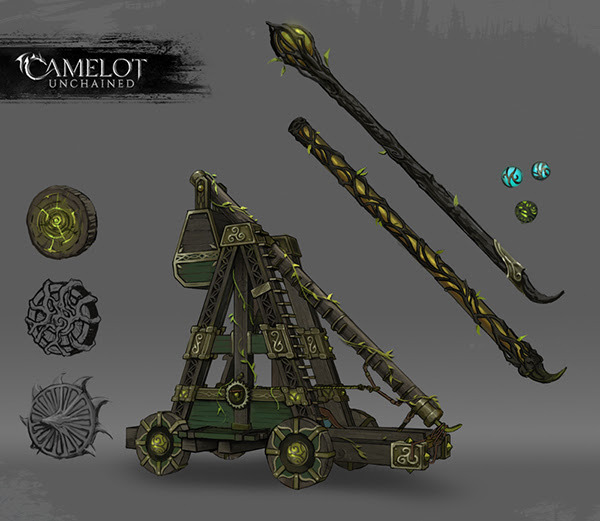 For art this week, let’s take a look at the trebuchet concepts from Michelle. Our initial goal was a quick “skinning” pass where we primarily focus on texture change vs. all new models from scratch. This allows us to iterate on testing faster. The next image shows possible work where we might explore modeling changes to further differentiate them. I’m particularly interested in the FX that we can build for the ammo ideas on the right-hand side! Like big magicky TDD impact explosions! 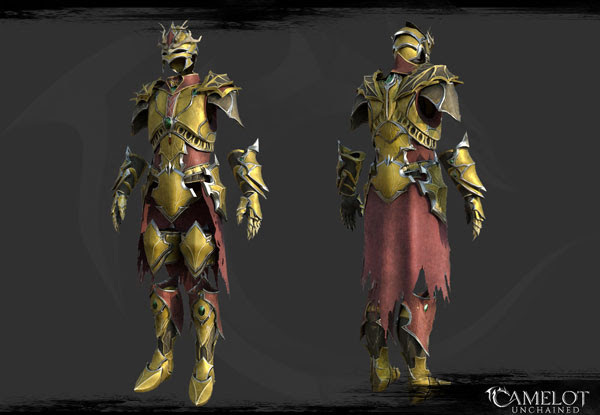 Next up, Jon updated the older TDD Autumn Court armor. While this isn’t currently used in the game, now that this suit is updated, we can add it. Additionally, he completed the update to the NPC male clothing. You can see the female versions HERE. We previously put these in rather quickly for Beta, and did not set them up for use by players. Dionne is fixing this, so we can later give players some basic clothing for that “about town” look. From left to right, first is Arthurian, then Viking, then TDD. Dionne has already begun creating the LODs, starting with the ones currently used in-game on the home islands. 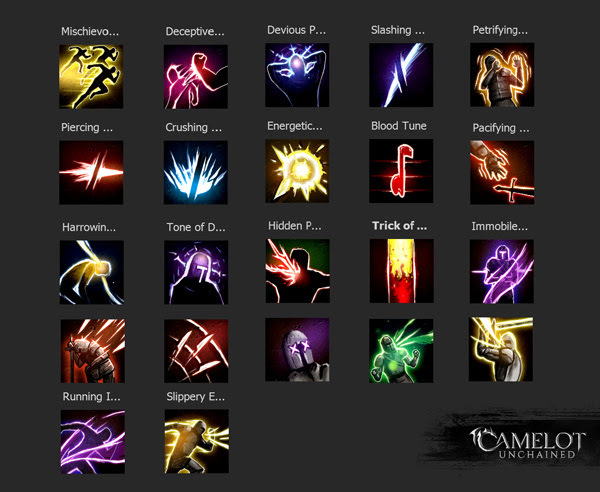 James followed up last week’s new class ability icons with….you guessed it! More icons! See if you can figure out what type of abilities they might be used for. That’s all for this week’s update as we move into what promises to be a chilly weekend here in VA, complete with several inches of snow. Have a great weekend, all! Is it Friday already! So much progress part deux! Afternoon Update – Friday, January 22nd, 2016 – The Snowniño cometh!